The ARO (reputedly an anagram of ‘Analogue Rules Okay’) arrived to a stunned silence. 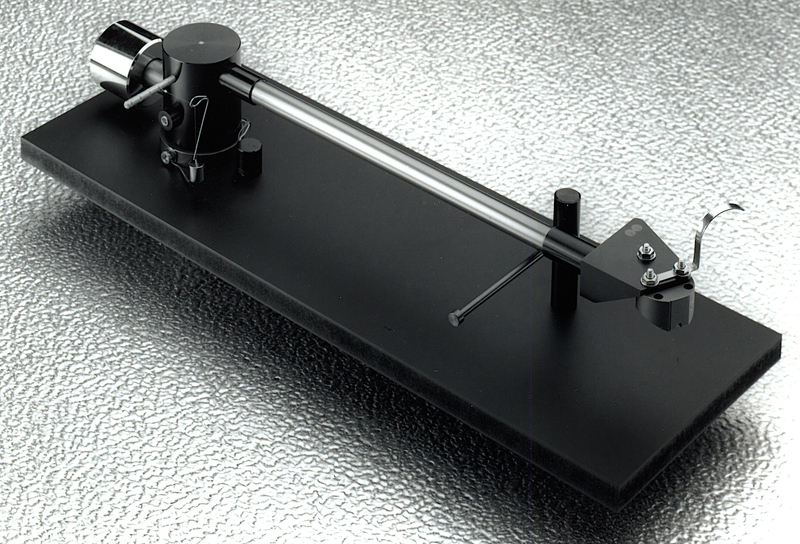 At the time, unipivot tonearms represented a conceptual volte face on the wisdom of the time. Lest we forget, the world was advocating rigidity because the thinking of the day was that the turntable was a ‘closed loop’ where energy should not be allowed to escape. A unipivoted tonearm bearing wasn’t exactly an arch exponent of this! Designed by French-born Guy Lamotte, the ARO brought some neat thinking to the table. The armtube is arrow-straight precision aluminium alloy, the counterweight set low to lower the arm’s centre of gravity to below the pivot point (reputed to give about 6dB of mechanical damping of the stylus), and the bearing is inverted compared to normal unipivots, so the bearing housing carries a sharp tip inside which sits on top of the turntable mounted cup, which serves as a mechanical ground. If this wasn’t weird enough, the headshell was a whole new bundle of fun. The ARO came with three holes for Linn’s three-point mounting cartridges (Troika, Archiv, etc. ), so there are no slots for aligning cartridges, and no sled-type arrangement a la SME. Naim says that the extra structural rigidity given by fewer cut-outs to the headshell has a more positive influence on the sound that the deleterious effects of incorrect overhang adjustment. I am not convinced about this. In truth, the possibilities for misalignment aren’t that pronounced – Linn cartridge mountings are about 7mm from the stylus, whereas others rarely exceed 10mm. Even with slots, it’s perfectly possible to get your cartridge 3mm out (and many people do), and then it also may be not parallel to the headshell either, creating extra scope for sonic problems. If you’re super paranoid, a machine shop could always drill a pair of additional holes 3mm back from the normal ones, or you could simply contact the cartridge manufacturer for precise info on this particular point. Despite its fiddly looks, the ARO is easier to set up than you’d think – the main boon is that the whole arm assembly can be lifted from the arm base when you’ve disconnected the tiny signal lead plug. This makes cartridge mounting a breeze. Once you’ve bolted your cartridge into the holes provided(! ), drop the arm onto the base, do up the cable plug, set downforce using the Ortofon stylus balance provided and set the azimuth in the headshell so it sits at 45 degrees. The ARO is smooth, sweet, beguiling and musically lucid, but compared to some rival super arms it comes over as rather fluffy sounding. Still, once you get used to its character, you quickly fall for its charms and find other arms just a little fussy and frigid. The essence of the ARO is its superb midband, which is not only very well proportioned spatially, but beautifully carried in terms of timing and dynamics. Music flows along like a roller coaster, and the arm sings exceptionally articulately, with every vocal phrase and minute inflection of intonation conveyed with ease. Each element of the mix fits together in a beguiling yet believable way, and the music is wonderfully ‘all of a piece’. The downside is at the frequency extremes, where it sounds a bit rolled off up top, and soft down below. Compared to the rival Ittok LVIII of the day, it lacks clarity in the treble or tautness in the bass – which are typical unipivot traits. It just doesn’t have the thumping, propulsive bass either, although the Naim makes up for it in sheer tunefulness. Interestingly, I know several highly discerning Linn LP12 owners who have ended up with an ARO, having tried a range of apparently better, pricier and more incisive tonearms beforehand. I’d say owning one is a sign of a sophisticated listener who puts musicality before all else. That’s the mark of a great tonearm, is it not? … and no mention of the it being a rip-off Hadcock/Mayware copy sans any of the real virtues of the Hadcock. Remember the Hadcock 228S (or D, but not the later E) featured an offset mount-hole on the main counterweight, effecting the same drop in horizontal centre-of-mass as the dropped weight on the ARO, but also facilitated incredible ease of adjustment of lateral balance; the Hadcock had an elegant means to adjust overhang by moving the entire shell up and down the tube (so still enjoying the single-hole cartridge mount); further, the Hadcock afforded the means to silicon fluid damping. Even the old Decca London arm had these same advantages over the ARO. I have never owned an arrow but a good friend has one on an LP12, always sounded very musical like most unipivots and besides the Alphason 100mcs tonearm is the best I have heard on the LP12 much better in fact than Linns own Ittok or Ekos tonearms which are a rip off in my opinion.